On the eve of the Bell Capital Cup, and with more than a dozen competing teams in the stands watching, a Bell Capital Cup alumnus gave an on-ice lesson in what a natural goal-scorer is all about. 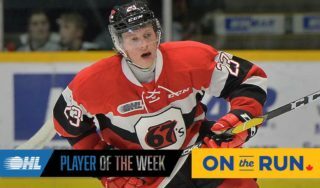 Tyler Toffoli, who played in the tournament in both 2003 and 2004 as a member of the Toronto Jr. Canadiens, scored from just about every angle and in any fashion imaginable short of upside down, scoring five in total to single-handedly overwhelm the Kingston Frontenacs and lead the Ottawa 67’s to a 9-0 victory in an Ontario Hockey League game before a crowd of 7,709 at the Rona Centre on Wednesday night. All Toffoli did was shoot, shoot and shoot some more. 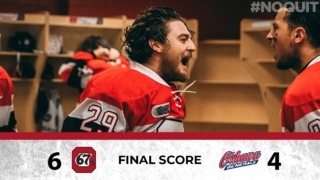 The OHL’s leading goal scorer had the natural hat trick by the time the contest was 13:45 old, and he added a fourth goal before the opening period had ended. Toffoli virtually had the rest of the night off, though he did score his fifth goal of the night on a power play, giving him 34 for the season. He played just one shift in the third period and got more ice time than that when the three stars were announced. “It just seemed like everything I shot went in,” said Toffoli. Toffoli scored his first on a seemingly harmless shot from the boards at 3:34, scored his second from the faceoff circle at 11:01, added a third on a breakaway and completed the period by taking a pass from linemate Shane Prince and blasting one past a helpless Franky Palazzese at 18:35, extending the 67’s lead to 5-0. Things didn’t get any better in the second period for the Frontenacs, and head coach Doug Gilmour exited the ice doing some finger-pointing at 67’s counterpart Chris Byrne over the top line playing the power play with the home team up by five goals. 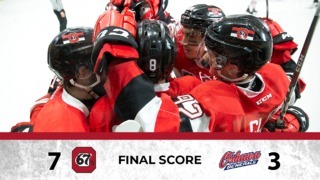 The five-goal performance was one shy of the league record in a game shared by nine different players, including Tim Young in Brian Kilrea’s first season with the 67’s in 1973-74 and Ottawa West minor hockey grad Mario Simioni, who accomplished that feat in 1982-83 as a Toronto Marlboro. 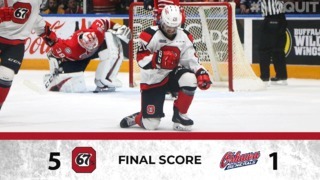 Wednesday’s game also produced Petr Mrazek’s first shutout of the season with 34 saves on the Frontenacs, who are 2-6-1-1 in the past 10 games.